It is not that Candy Chang’s mural She Dreamed of a Place Called Fat City is easy to skip over, no sir; instead, the intense mural demands the outsider to pause and to question its placement. The large black and white painting is made mysterious by the seemingly unrelated depictions melted together, like a lone woman walking on a gear appearing to revolve in perpetuity, and coupled with the text of a puzzling story. Why is this probing artwork situated on a bumpy street with only a few restaurants and expressionless storefronts? Yes, the location is Fat City, but what is this curious place? Fat City used to buzz like Bourbon Street. In the late 1970s this section of Metairie resembled the French Quarter. Its illustrious bars and clubs fueled lively parties. Imagine a “thriving adult playground”(4) whose jovial games were charged by alcohol and music. But the fun did not last forever. The lighthearted activity found in places like the Huki Lau, a tiki bar, and the bar Red Caboose, deteriorated. Fat City’s bars became strip joints; its spirited charm was replaced with unbridled raucousness. Crimes like prostitution and illegal drug activity became Fat City’s bread and butter (1). Now in 2019, Fat City is undergoing a “makeover” (1). Officials are attempting to replace current institutions with the fixings of a “mixed-use neighborhood” (1), including a residential base, retail spots, and restaurants. Efforts push Fat City to become a “town center for Jefferson parish, attracting new commercial activity and fostering a new vitality for Fat City residents” (6). To start, earlier closing times were imposed on bars (1). Such restrictions have worked, by 2014 only seven bars remained (4). The area’s proposed transformation from a bar scene to a composed and prosperous neighborhood is further facilitated by The Fat City Mural Project, which consists of ten artworks. Together the murals have a purpose; they are intended to “enliven previously blank walls and unify the neighborhood by inspiring creative thought and conversation among residents and visitors” (6). Thus, the project is closely tied to a larger process of a changing community. Chang’s mural emphasizes this association between community renewal and art. Chang depicts a mash of objects that seem to come from a woman’s lips, with cars, gears, and a man whose head has been replaced with a metal item. The puzzling array of objects does not make sense until one reads the mural’s text. The mural includes a story by James A. Reeves (5). Reeves’ story follows a woman who feels a somewhat otherworldly pull to Fat City. What she encounters is at odds with her magical expectations. She looks for wacky bars, but “Now the Place Across the Street is someplace else.” Ultimately, Reeves’ story conveys a search for something that has already changed. The images and text come together to produce meaning. Chang has commented on the message within this piece in Fat City: “I wanted to pay homage to its history and create a modern mythology. It’s about the mythologies we create for our communities and ourselves, and the potential of deeper storytelling in public to help us make sense of the beauty and tragedy of life with the people around us” (7). She Dreamed of a Place Called Fat City presents a mystical mythology to the public through its story and accompanying illustration. I surmise that through the inclusion of a tale about one woman’s imaginary relationship with Fat City’s evolution, Chang invites passersby to reflect on their own experience with change. Ultimately, this process may fulfill the hope of reconciling these changes in the community. Simply, themural “explores the possibilities of site-specific storytelling in public space” (5), pressing the public to reflect on their location. As one of the onlookers, I can say Chang’s mural does prompt such reflection; her initially enigmatic myth comes to life through contemplation. The mural project as a whole has similar intentions; it is all about coming to terms with the old and new Fat Cities. The murals, “While fostering conversation about beauty and art, [will] serve as positive landmarks for those trying to navigate the evolving landscape and growing business community” (6). So, Chang’s She Dreamed of a Place Called Fat City has a pretty big task ahead of it. This piece of public art goes beyond aesthetics. The mural serves a role in the process of coming to terms with something. Art is, and has often been, deployed to assist in societal changes, even before Fat City as well. Julie Crawshaw focuses on public art in Sunderland, North East England. In Sunderland, art also functions as a “regeneration practice” (3). Crawshaw writes that in the late 1990s, it was confirmed by “Chris Smith, then Secretary for the Department for Culture Media and Sport (DCMS) [that] the arts, sports, cultural and recreational activity ‘can contribute to neighbourhood renewal and make a real difference to health, crime, employment and education in deprived communities’” (3). Art takes on an integral role in the regeneration of communities elsewhere, and perhaps Candy Chang is hoping this rejuvenation can hit closer to home. However, proliferation might not mean success. Public art might have grand aspirations, but can it achieve these? Does Chang’s mural in fact help the public resolve Fat City’s transformation? In “Beyond public Artopia: Public Art as Perceived by its Publics,” Martin Zebracki focuses on public perception of public art, thus complicating the producer’s intentions with the reality of public interpretation. A study revealed that public art does not always translate. Zebracki finds inconsistent extraction of meaning from public art. In Zebracki’s words, “where the artworks are intended and likely to invite a profound discussion about the artworks per se and their relation to the dynamics of the environment, the publics generally came across as moderately engaged in this or at times could not even form an opinion at all” (8). He comes to this conclusion based on results that only one-fifth of the public found a deeper meaning in public art (8). Thus, it is unclear if art can fulfill its purpose. Yet,Chang is likely to stand by She Dreamed of a Place Called Fat City and the art in Sunderland. Chang’s “work lies at the intersection of contemplative practice and the built environment” (2); thus the physical products incite thinking. Her murals are not meant to just be pleasing to the eye; Chang’s art strives for “activation” (2). In this way, Chang’s works uphold the idea of art pushing beyond aesthetics into another realm. Murals like Chang’s have become a part of Fat City’s intended revamp. While public art strives to do so much in this locality, the purpose and effects of public art are complicated. Art’s many roles are murky; as a marker of societal change, public art may operate in complex ways. Thus, a trip to Fat City is mercurial; visitors that once guzzled beers amidst lively tunes today imbibe ideas about an uncertain identity. This piece was written for the class “Alternative Journalism,” which is taught at Tulane University by Kelley Crawford. 1: Bacon-Blood, Littice. “Restoration in Fat City: 10 exciting things happening in a once-derelict neighborhood.” NOLA.com | The Times-Picayune, 5 Apr. 2018, https://www.nola.com/business/index.ssf/2018/04/restoration_in_fat_city_10_hap.html. Accessed 18 Feb. 2019. 3:￼ Crawshaw, Julie. “Working Together: Tracing the Making of Public Art as Part of Regeneration Practice.” Anthropological Journal of European Cultures, vol. 24, no. 2, 2015, pp. 79, https://www.jstor.org/stable/10.2307/26355951. Accessed 1 Feb. 2019. 4: Scott, Mike. “The rise and fall of Fat City, Metairie’s answer to the Vieux Carre.” NOLA.com | The Times-Picayune, 15 Oct. 2017, https://www.nola.com/300/2017/10/fat_city_metairie_history.html. Accessed 1 Feb. 2019. ￼5: “She Dreamed of a Place Called Fat City.” Candy Chang, http://candychang.com/work/she-dreamed-of-a-place-called-fat-city/. Accessed 18 Feb. 2019. 6:￼ “The Fat City Mural Project.” Arts Council New Orleans, http://www.artsneworleans.org/fat-city/. Accessed 18 Feb. 2019. ￼7: Wooten, Nicholas. 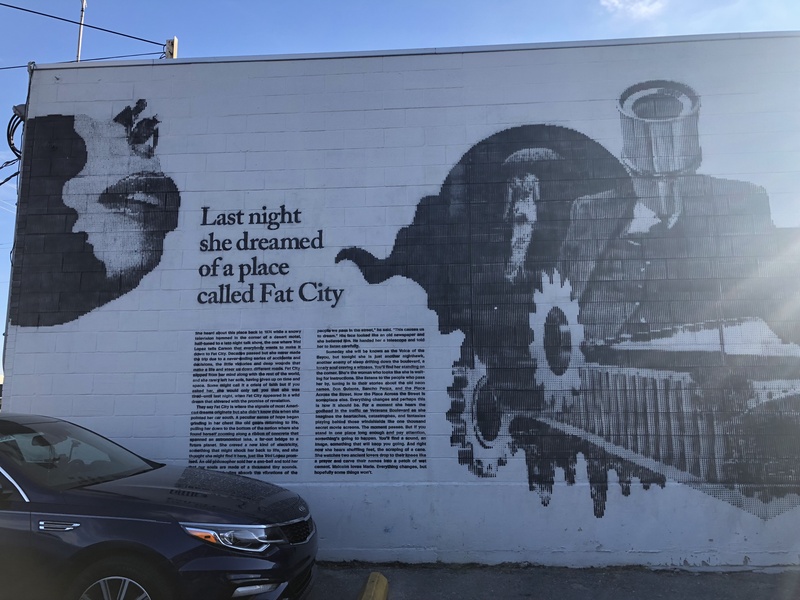 “Artist Candy Chang paints mural recalling Fat City’s past.” NOLA.com | The Times-Picayune, 22 Jul. 2015, https://www.nola.com/politics/index.ssf/2015/07/fat_city_murals_fat_city_frien.html. Accessed 1 Feb. 2019. 8:￼ Zebracki, Martin. “Beyond public artopia: public art as perceived by its publics,” GeoJournal, vol. 78, no. 2, 2013, pp. 314, https://www.jstor.org/stable/42006321. Accessed 1 Feb. 2019. Candy Chang’s She Dreamed of a Place Called Fat City is located at 3220 Edenborn Avenue in Metairie, LA. Completed in 2015, the black and white mural includes text by James A. Reeves. The piece intends to spark conversations about changes in the community.